Author, activist, erstwhile rapper and former Barack Obama surrogate Cornel West became the president’s First Hater (at least from the left) shortly after inauguration, because of Obama’s betrayal – whether of progressive principles, or West personally, has never been clear. When West was criticized for his fierce Obama attacks by progressive colleagues and friends, he turned his enmity toward his critics, particularly African Americans he saw defending the president on MSNBC: most notably Rev. Al Sharpton, Melissa Harris-Perry and Michael Eric Dyson. But while folks on the multiracial left have been puzzling over and lamenting West’s ad hominem haymakers at former friends for years now, when Dyson struck back this week in the New Republic, he came in for a lot of “how could yous?” — even from some of West’s critics. Dyson is now being attacked for doing to West what West did to Obama: acting at least partly out of a sense of betrayal and hurt. One difference is, Dyson owns it, laying it bare in the piece. He admits his decision to break with West is fueled by pain and confusion, and having had enough – in his case, enough personal insults, as well as insults to colleagues and friends and the president the author both admires, and pushes, in his own way, to be better. “Our lost friendship is the collateral damage of his war on Obama,” he writes. Dyson makes the case that the issue isn’t how West has treated him, but how he’s helped set back left-wing politics in the age of our first black president. Read More “Calling Obama a ‘global George Zimmerman’? No. 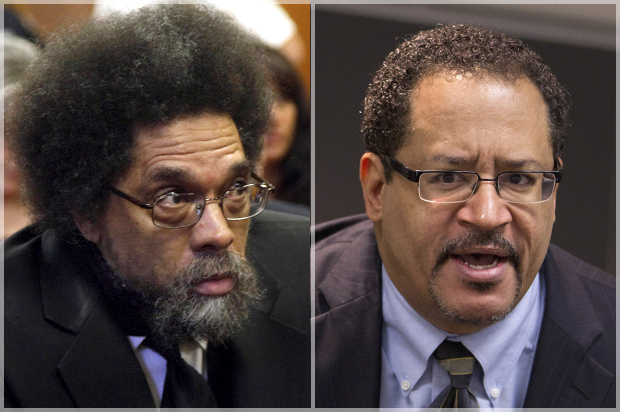 No.”: Michael Eric Dyson sounds off on Cornel West, Obama & his critics – Salon.com. This entry was posted in News from the Soul Brother and tagged Barack Obama, Black politics, Cornel West, Michael Eric Dyson, politics, race. Bookmark the permalink.